Whether you are playing the guitar as a hobby or as an aspiring band player, you have to keep in mind that being able to play only a part of a song on your guitar is not enough at all. Unless you are satisfied with the standard type of guitar playing, you could not take pride in your playing if you do not know the techniques that are associated with excellent guitar playing. Also, identifying the guitar techniques is one thing, but executing them well is another thing. That explains why it is entirely necessary to learn the most important techniques used for the instrument. As a guitar player, it is quite essential for you to familiarize yourself with the techniques early on so that you can add an enthusiastic touch to what you are playing. Below are some of the guitar techniques that are very useful in improving the quality of your playing regardless of any music genre you wish to play on your guitar. Vibrato is a very significant guitar technique that any guitar player must try to learn as this typically enhances the emotional aspect of the song. As a result, the music does not sound dull or boring in any way. You can especially express your own interpretation of a certain song through the use of vibrato since it basically does not only add quality to the notes but also makes it possible for any player to sustain the notes that are being played. Very closely related to string bending, this interesting technique is actually necessary for almost any music piece. In this type of technique, the fingers and wrist are basically used. The way Eric Clapton and B.B King use this technique is quite impressive. This technique is quite basic that you must learn it as well. It actually makes a note sound great as you play it. It is also used to create a smooth transfer of the finger from one note to another note. With the use of this technique, you can slide one finger from one note to the next note. If you prefer to increase the pitch, you perform the slide up movement. On the other hand, if you prefer to decrease the pitch, you execute the slide down movement. You must remember that this technique is basically applicable to one string alone. Much can be said about this amazing technique. As it is very much related to vibrato, bending also makes it possible for your guitar to add an emotional force into the music. This is a difficult technique to master that will need a great deal of practice; however, once you get good at it, it does not only add life to your song but also to your guitar! The music sounds even better when you tend to bend the guitar strings precisely. As you are playing a certain note, you can increase its pitch anytime you wish by executing the bending technique. 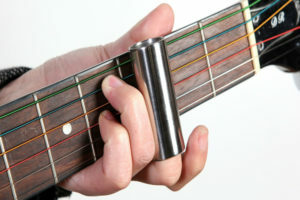 This special technique is very useful in playing blues, rock or even almost any kind of music. Moreover, this is a versatile technique since it also applies to an electric guitar and an acoustic guitar. Palm mute has a distinctive style due to the fact that the side of the guitarist’s right hand is used so that a few or all of the guitar strings are entirely muted or slightly muted. This kind of technique produces a striking percussive sound. You will often use this technique when you play heavy metal. However, it is not only limited to this type of song as it can also be employed in other songs whether you are playing an electric or an acoustic instrument. Both of these techniques create a legato on one string. When you play the notes in such a way that they tend to connect in a very smooth manner and not in an abrupt way, this style of playing is called the legato style. For this reason, the pull off and the hammer-on techniques do not allow the guitarist to pluck the guitar string again, especially on the 2nd note. However, what separates these two techniques is the fact that the hammer-on is typically used to slur to the 2nd note with a higher pitch, while the pull-off is basically employed to slur to the 2nd note with a lower pitch. This is a remarkable technique that is worth learning. This is primarily targeted on playing individual notes. When you use this technique, you basically play a single note with a single finger as well. This makes an interesting sound, especially when you combine the bass notes with treble notes as you play. 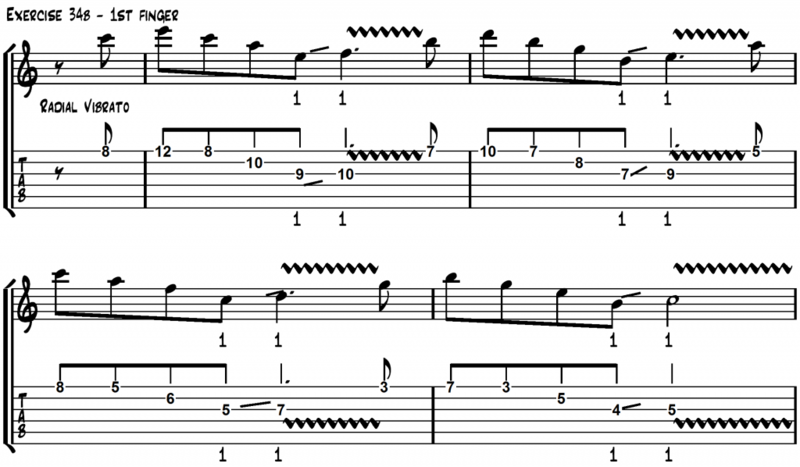 Fretting is a very basic aspect in guitar playing that you must learn it at once. Fretting the wrong way can actually affect your playing speed. This can help make your playing sound accurate and clear, especially when it is done correctly. 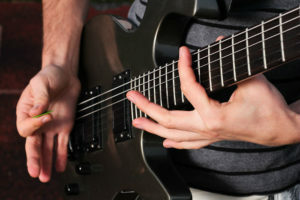 The key is to be able to arch your finger properly in such a way that you avoid touching the guitar strings that you do not intend to fret at all and so that you can directly touch the exact strings. 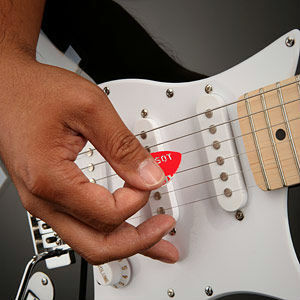 While using this technique, make sure that you only get to touch the strings lightly. If not, it will decrease your playing speed. Strumming is a very important part of playing any music, so you should diligently learn how this should be done correctly. With this technique, you can either use your fingers or the pick. For you to be able to execute this technique properly, all you have to do is to simply glide your fingers or the pick across the guitar strings, depending on the rhythm patterns. 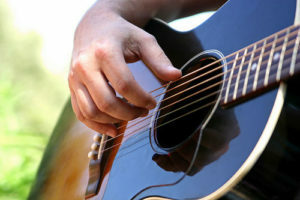 The thing is such patterns differ from one song to another, so you really have to study how to strum your guitar based on the type of song that you want to play. Tremolo picking brings a powerful effect on your playing. This technique will make it possible for you to play certain phrases in music in a fast manner quite easily without expending too much effort. This technique allows you to play a note or more notes many times in succession at a rapid tempo. It may take a lot of time and effort to practice this technique until you get the hang of it, but it truly adds value to your style of playing. Some guitar players are more comfortable with using their fingers than using the pick. However, it is a good idea if you know how to use both. Be sure to use the guitar pick correctly since it can help you increase your speed when you play. However, never ever try to pinch it when you hold it as this will prevent you from playing in a fast manner. As there are actually so many different techniques in guitar playing, it is quite ambitious to learn all of them at once. The best thing for you to do is to try to learn them one at a time so that you can fully grasp their importance in your playing and master them eventually. Although it relatively depends on one person to another, you have to take note that it can generally take time to learn and really get good at executing a certain technique. Basically, mastering any technique depends on your determination and the number of hours you spend on your practice time. Well, your innate talent in music can also help, but without consistent practice it only amounts to little or nothing at all. Therefore, it is necessary that you learn the techniques and allocate a special amount of time to practice them on a regular basis.